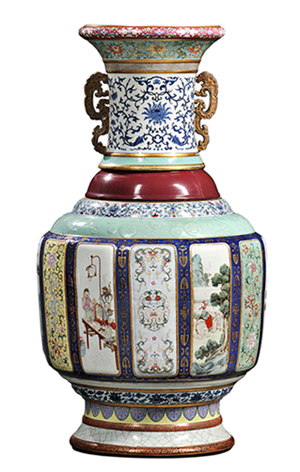 Skinner Sets U.S. Record with $24.7 Million Sale of a Qing Dynasty Vase | Skinner Inc.
BOSTON, MA – September 23, 2014 – A monumental Fencai Imperial Qing Dynasty vase auctioned for $24.7 million at Skinner on September 17th, topping all sales of Chinese works of art in the U.S. and setting a record as the top grossing lot ever sold in New England. The Skinner Asian Works of Art auction coincided with Asia Week, and this vase surpassed all other objects sold during the event. An intensely focused and enthusiastic crowd packed the auction room, and most rose to their feet as the vase soared past the $10 million mark. After spirited bidding from multiple bidders present in the room and participating by phone, the hammer fell to a round of applause. According to Judith Dowling, Director of Asian Works of Art at Skinner, Inc., “The vase is a tour-de-force of ceramic techniques, and it is believed that the Emperor ordered it made.” It was fired at the Jingdezhen kilns under the direction of the famous superintendent Tang Ying (1682-1750). The National Palace Museum in Beijing, China is home to the only other known example of the same size and decoration. Prior to the auction, previews in New York and Boston generated tremendous excitement. Interested collectors arrived from around the world to view the historically significant piece in person. Skinner auctions draw international interest from buyers and consignors alike, with material regularly achieving record prices. The company’s auction and appraisal services focus on fine art, jewelry, furniture, and decorative arts from around the globe, as well as wine, fine musical instruments, rare books, clocks, Judaica, and more. Monthly Skinner Discovery auctions feature a breadth of estate material. Widely regarded as one of the most trusted names in the business, Skinner appraisers have appeared on the PBS-TV series, Antiques Roadshow, since the show’s inception. Skinner has galleries in Boston and Marlborough, Massachusetts, as well as in Coral Gables, Florida, with an international audience of bidders participating in person, by phone, and online through the SkinnerLive! online bidding platform. For more information and to read our blog, visit the website at www.skinnerinc.com, find us on Facebook, or follow us on Twitter. This entry was posted in News and tagged $24.7 million, asia week, auction record, Chinese antiques, Chinese art, Imperial China, Imperial vase, Judith Dowling, Qianlong period, Qing Dynasty by Skinner. Bookmark the permalink.